For decades Russia's White Sea region was a forbidden area, and largely due to its geographic isolation, the world's largest and perhaps least understood country remains a region of great mystery today with great appeal for inquisitive, adventurous travellers. Wild Earth Travel is offering two special expeditions on board the 116-passenger MS Island Sky which will spend four days in the White Sea, exploring the historic city of Archangelsk and fascinating and turbulent history of the Solovetsky Islands. In the 18th century Archangelsk was the centre of Russian ship building and occupied by 'White Russians' immediately after the 1918 Revolution. Tours of the city will include the wooden houses of the old quarter, the Museum of Fine Arts, Trotsky Prospect and the Orthodox Church. On the Solovetsky Islands, a vital submarine base was established and Stalin built one of his infamous gulags in the vast medieval fortress of the 16th century Solovetsky Monastery. The voyages also visit Murmansk, the largest city in the world north of the Arctic Circle, where passengers will learn of the region's cultural history, including the indigenous Sami people and the first hardy Russian settlers, as well as visiting historic WWII monuments. Making the most of the almost perpetual daylight, the voyages will call into some of the smaller islands, viewing unique birdlife and cruising the White Sea in rubber inflatables in search of Beluga whales, where a colony of around 2000 animals live. The 14-night 'White Sea Odyssey' voyage departs from Edinburgh, Scotland on 5th June 2012, cruising the Northern Isles and magnificent seascapes, landscapes and towns and villages which hug the shoreline of Norway's Atlantic coast, crossing the Barents Sea and concluding in Archangelsk. 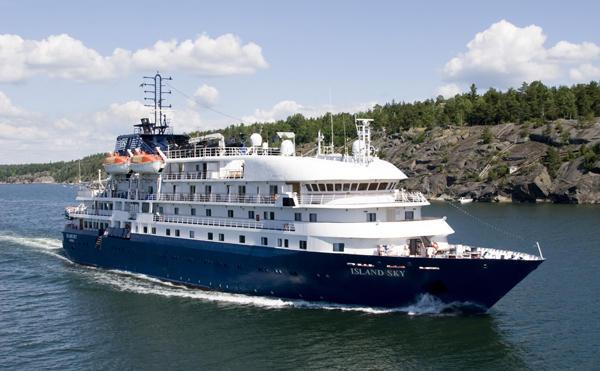 A 12-night 'White Sea Odyssey II' voyage embarks in Archangelsk on 19th June 2012 and follows the same route in reverse, concluding in Bergen, Norway. Pre or post-cruise stopovers are available in Moscow or St Petersburg on both voyages. An expert expedition team has been brought together for these voyages to help further passenger's understanding of this intriguing region, including renowned military historian Major JGH Corrigan MBE; University lecturer, historian and author, Imogen Corrigan; and Norwegian-based sociologist Thomas Nilsen, who has travelled extensively in northern Russia since the late 1980s, working on environmental issues, nuclear safety and cross-border cooperation. The MS Island Sky has recently undergone a multi-million dollar refurbishment and offers a range of suites all with private facilities, bar-fridges, flat-screen televisions, DVD and CD players and telephones. This luxurious expedition ship has a high passenger to crew ration, and offers more comforts than those associated with the former Russian research vessels. Prices start from AUD$6,760/NZ$9,065 and include economy class air travel from London or Norway; 12 nights ship-based accommodation with all meals, onboard lectures, shore excursions, gratuities, transfers, and port and airport taxes. New Zealand-based Wild Earth Travel specialises in small ship expedition style travel focused on conservation and educational travel experiences. Whether you want to kayak with dolphins, march with the penguins, see the northern lights or sip Chianti beneath the vines, Wild Earth Travel has a cruise to suit in destinations such as Antarctica, the Arctic, Africa, Asia, North & Latin America, Northern & Southern Europe, Australia, New Zealand and the South Pacific.